Branson is home to three world class fisheries. You can choose between Bulls Shoals and Table Rock Lake’s bass fishing, or Lake Taneycomo’s amazing trout. No matter what kind of fishing you are looking for, Branson has it all! Table Rock Lake offers excellent fresh water fishing for warm water species such as Large Mouth Bass, Spotted Bass, White Bass, Crappie, Channel Cat, Bream, other panfish. 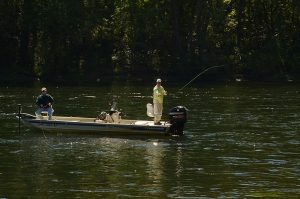 In addition, the cold water of the tailwaters of Table Rock Dam serve as the headwaters for Lake Taneycomo, a world class fishery for Brown and Rainbow Trout. The Lake provides excellent fishing all year long, seldom freezes, and has no closed season. Obviously the best Large Mouth fishing will be in the Spring and Fall of the year but excellent Large Mouth Small Mouth, and Spotted Bass fishing is available all year providing the angler is willing to modify their tactics to fit the changing conditions. Night fishing for Large Mouth Bass during the months of July and August can produce some nice fish. Early morning fishing for Small Mouth along the banks south of the Table Rock Dam can also provide excitement. Bull Shoals Lake offers some of the finest and most varied fresh water fishing anywhere. On average it is a warm water lake offering the standard varieties of warm water fishing such as Large Mouth Bass, Spotted Bass, White Bass, Stripers, Crappie, Channel Cat, Bream, other panfish, and Walleye. On the upper end of the Lake, near the portion of her headwaters consisting of the tailwaters of Lake Taneycomo, there is enough temperature variation to offer Trout fishing for both Rainbow and Brown Trout. It should also be pointed out that the tailwaters of the Bull Shoals Dam feed the White River and its world class Brown Trout fishery. Excellent Rainbow and Brown Trout fishing is also provided in Lake Taneycomo located above the Power Site Dam near Forsyth, Missouri. The Lake provides excellent fishing all year long, seldom freezes, and has no closed season. In the Spring of the year the upper end of the Lake is renowned for its fabulous White Bass and Walleyes fishing. Obviously the best Large Mouth fishing will be in the Spring and Fall of the year but excellent Large Mouth and Spotted Bass fishing is available all year providing the angler is willing to modify their tactics to fit the changing conditions. Night fishing for Stripers, Walleyes, and Trout is very popular and efficient with the Lake fast developing a reputation for excellent night time Striper Fishing. Lake Taneycomo’s clear cold waters provide some of the finest trout fishing available anywhere in the world. The Rainbow Trout and Brown Trout that ply the waters of Lake Taneycomo provide a year round fishing experience that is exciting as well as varied. 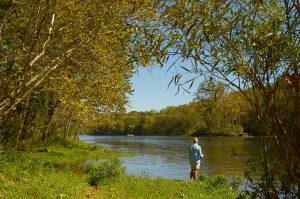 From Fly Fishing and artificial only fishing in Lake Taneycomo’s Trophy Trout Area, near her Headwaters, to bait fishing outside of the Trophy Trout Waters, Lake Taneycomo offers Rainbow and Brown Trout fishing at its best all year round.